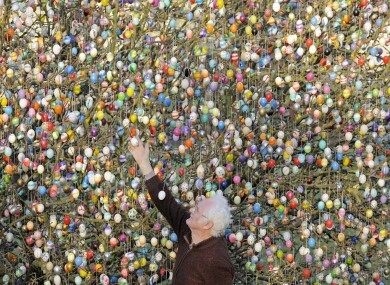 Retired German couple Volker and Christa Kraft decorate a tree in their garden with 10,000 Easter eggs today. They've continued the tradition for more than forty years. EVERY EVENING, TheJournal.ie brings you a round-up of all the day’s main news, as well as the bits and pieces that you may have missed along the way. The eagerly-anticipated final report from the 15-year-long Mahon Tribunal into planning corruption and payments to politicians will be published tomorrow morning, according to a source close to the proceedings. A gunman who is believed to have shot dead seven people, including three soldiers and three children, in France over the past two weeks is still besieged by authorities in Toulouse. Sky News reports that the killer was planning a fresh attack. Police want to capture the man, who says he is al-Qaeda, alive. The UK’s Chancellor George Osborne has announced his 2012 Budget, including immediate cuts to the rate of corporation tax and a new tax credit on animation and video game companies. Back in Ireland, the Department of the Environment has said that the Household Charge cannot be paid at post office counters because third party collections require procurement processes which would have delayed the property tax promised to the IMF. VHI has reported an annual after-tax profit of €7.4 million for 2011. Public transport just got a little bit better – Bus Éireann has rolled out WiFi on 88 new buses. Are you an AIB customer? Have you less than €2,500 in your account? If you’ve answered yes to both these questions, you may be liable for transaction fees. What’s the price of a dozen eggs these days? In this evening’s column, Catherine Lynch argues that racism is an Irish reality and we need to stop pretending otherwise. It was quite a love-in between the Kennys, the Bidens and the Obamas at the White House. Watch the opening speeches from the three men. The boys are back in town: both Leo Cullen and Brian O’Driscoll will play some part in this Friday’s RaboDirect Pro12 meeting between Leinster and the Ospreys. Meanwhile, Jerry Flannery has retired from professional rugby. Today marks the 1,000th day since Michael Jackson passed away suddenly. Twitter has been remembering the King of Pop. Nokia has come up with an unusual way to ensure its customers never miss an important call. This video, which has gone viral thanks to reddit.com, reminded us here of the Crystal Maze on Channel 4. Someone should have told this dude that it was the wind that made the game difficult.